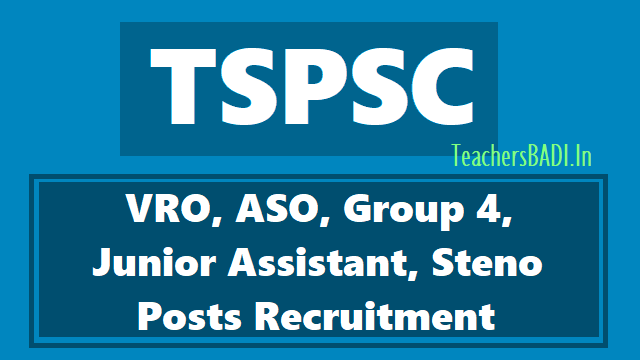 TSPSC VRO, ASO, Group 4, Junior Assistant, Steno Posts Recruitment 2018: TSPSC VRO Posts Recruitment 2018, TSPSC ASO Posts Recruitment 2018, TSPSC Group 4 ServicesPosts Recruitment 2018, TSPSC Junior Assistant Posts Recruitment 2018, TSPSC Senior Steno Posts Recruitment 2018. On the eve of State Formation Day, the Telangana State Public Service Commission (TSPSC) announced that 2,786 vacancies under Group-IV, VRO and ASO categories are notified on June 2. 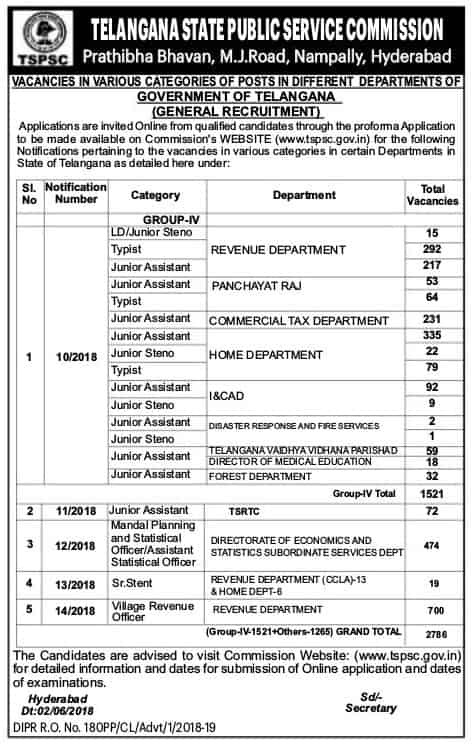 Vacancies are available for various posts under Group 4 services, Telangana State Road Transport Corporation, Directorate of Economics and Statistics Subordinate Services Department, Revenue Department and Chief Commissioner Of Land Administration Department and Home Department. State Public Service Commission (TSPSC) has notified recruitment for 2786 posts. 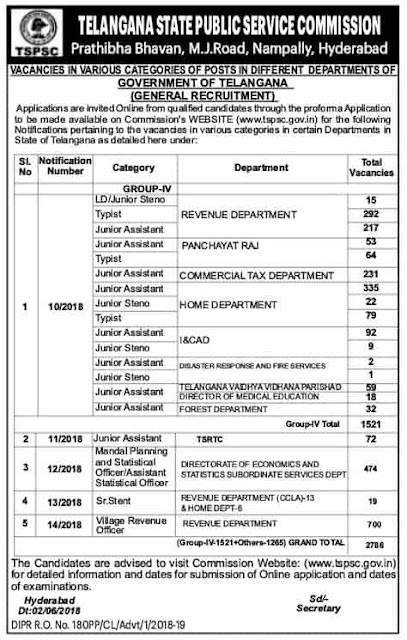 Vacancies are available for various posts under Group 4 services, Telangana State Road Transport Corporation, Directorate of Economics and Statistics Subordinate Services Department, Revenue Department and Chief Commissioner Of Land Administration Department and Home Department. A total of 1521 posts are open for recruitment under Group 4 services. Online application can be submitted at the official website of the Commission at tspsc.gov.in. The Telangana State Public Service Commission (TSPSC) decided to conduct common examination for the recruitment to Group-IV services and TSRTC posts on October 7. The PSC in a press release said the decision was taken as required qualifications, syllabus and scheme of examination were same. Candidates interested in applying for the TSRTC posts besides Group-IV posts will be considered as per their marks in the common exam. 1. Group IV posts: 1,521 are Group IV in various departments, including Revenue, Panchayat Raj, Commercial Tax, Forest, Home, I&CAD, Disaster Response and Fire Services and Medical & Health Department. 4. Senior Stenos: 19 vacancies of Senior Stenographers, of which 13 are in Revenue and 6 in Home Department, will be notified by the Commission. 5. Junior Assistants: In TSRTC, 72 posts, including Junior Assistant (Personnel) and Junior Assistant (Finance) will be notified. Above said the notifications are released on the State Formation Day on June 2.